You can find our first Policy Brief here! 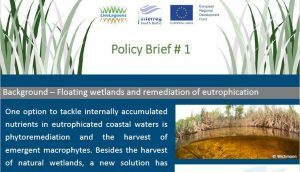 The policy brief #1 provides you with background information about floating wetlands and remediation of eutrophication. It also includes valuable recommendations what to consider prior to installations and how to choose the right plant species. The policy brief mainly aims at reaching interested coastal municipalities around the Baltic Sea which would like to improve their local water quality using macrophytes. The following policy briefs #2 and #3 will inform you about the nutrient removal efficiency and the biodiversity aspect of floating wetlands- stay tuned until the release!